Spanish filmmaker Luis Prieto on the set of "Kidnap" with Oscar-winning actress Halle Berry. After turning some heads in 2012 with his U.K. remake of Nicolas Winding Refn’s 1996 Danish crime thriller “Pusher,” Spanish director Luis Prieto was given his first shot in the American film industry with “Kidnap.” The film stars Oscar winner Halle Berry (“Monster’s Ball”) as Karla Dyson, a desperate mother who will do anything she can to find her kidnapped son. During an interview with me last week, Prieto, 47, who studied film at the California Institute of the Arts in L.A., talked to me about why “Kidnap” is different from other thrillers centered on missing children, and what he feels he brings to Hollywood as a Spanish filmmaker. When you came to the U.S. to study film a few years ago, did you have any expectations about where your career would take you? 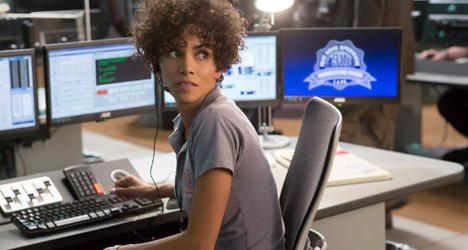 Did you imagine you’d be working with somebody like Oscar winner Halle Berry? No, I don’t think so. I never thought I would shoot a movie with Halle Berry. I didn’t expect that. I’ve taken an interesting path to get to this point. It’s been a very rewarding experience making this movie. Talk about the thriller genre. What does it takes to make a good one? What I find fascinating about making movies is making movies that are going to move people. In addition to this movie being an action thriller, it’s very emotional, too. [The film] is about the relationship between a mother and her child. When [Karla’s] kid is taken, she would do anything to get him back. Usually, action thrillers don’t include normal people. They include people who specialize in whatever – professionals. This [film] is very simple. It’s about the emotions between a mother and her son. She becomes a mama bear. She becomes a hero. She’ll do anything to get her son back. Everyone can relate to that. Talk a little more about bringing a mother into this story. Like you said, there have been other movies about kidnaps before – Liam Neeson in the “Taken” series, Mel Gibson and “Ransom” and Hugh Jackman in “Prisoners” come to mind – but we’ve never really seen a mother. That’s correct. You could take the whole genre of these kinds of movies, and we never get to see a woman much less a mother. We never get to see a mother who drives a minivan. There is a reality to this movie that makes it special. In those other movies, you’ll always find a male character who is very strong and knows a lot about doing action. They are usually men of action. But, here, we have a regular mother – a regular woman become the real hero in this movie. She’s a superhero in some ways. This is a movie about empowerment. Did you run into any challenges in the story because Halle is playing a regular mom? She might be a superhero in some respects as you just described her, but she’s not a former FBI agent or an assassin or someone with a killer instinct. It was very interesting because from the very beginning – and from all the conversations between Halle and myself – we always thought, “What would a real mother do?” Halley is a mother, so she would always say, “Oh, I would’ve done this or that.” We would have these reality checks constantly. She knew what she was talking about. Halle is very athletic, so it was easy for her to do the scenes in the movie. All she would do was think, “Would I do this for my son?” She always said, “Yes! I would do this and more!” A mother would do anything for her son. You see that in the movie. You can connect with that. It is very powerful to be able to celebrate that empowerment. There are some pretty physical scenes in the film. Did you push Halle very hard? Was she able to do everything you asked of her from a physical standpoint? We both wanted to do everything for real. I didn’t want to use green screens. Halle is very athletic, so she wanted to do most of it herself. When there’s a car chase in the movie, sometimes she’s driving. She’s a good driver. The crashes are happening for real. It wasn’t the easiest way to do it, but we wanted to do it that way. She was completely for doing it herself and never had any doubts. She was up for the challenge. It almost feels like a movie from the 80s because everything is done for real. And you were able to get that minivan to go as fast as you need it to? (Laughs) I have to say, we were all surprised at that minivan. Even when cars crashed into that minivan, nothing would happen to it. It was very powerful. It was kind of a metaphor for the mother. You think the mother is going to be weak, but she’s not weak. She’s very strong. By the way, we picked that minivan because it was the most popular minivan in America. It wasn’t your average minivan. It was absolutely remarkable. Very powerful and safe. We’re not doing any product placement here with the minivan, are we? (Laughs) Oh, there’s no product placement at all, unfortunately. It’s just the reality of that minivan. We didn’t expect that from that minivan. As a Spanish filmmaker, do you feel like you bring a new perspective to Hollywood? You know, it’s interesting because in Europe, we’re always making films from the heart and with passion and emotion. When you come to Hollywood, there’s always great stories, but sometimes they’re lacking heart. Sometimes they will follow a formula. What I like to bring to those great stories is a European heart. I think that was my contribution to the film. I connected with the emotion of the film, which is why I pushed everything to the limit. While making this film, I thought about my own mother and the women I know. That was what was important to me. What do you want out of a career in Hollywood as you move forward and take your experiences from this film to the next? For me, I like to make films that I would watch myself. It is important when you make a film that you have an emotional reaction to it. You should be entertained, but you should also have an emotional experience. That’s something I like. That’s the beauty of going to the movies. I love all kinds of movies, but that’s something I personally love.